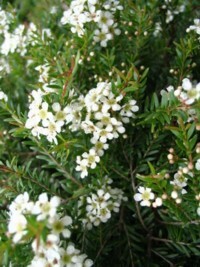 A highly ornamental, small shrub grown for its colourful,dark burgundy new foliage.Small white flowers are alsoproduced in summer followed by small blackfruit which are bird attracting.Grows up to 1.5m. 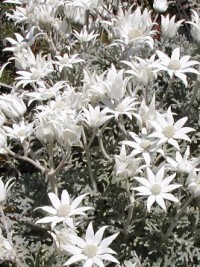 A fast growing and hardy shrub with attractive, glossy foliage and bearing masses of white,5 petalled flowers throughout Summer. 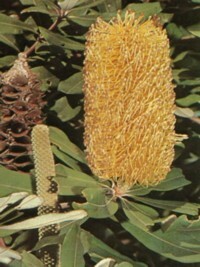 Grows 3 to 4m high. A very dense and compact,dwarf form of Baeckea virgata it is a very attractive little shrub. Bears masses of small white,5-petalled flowers. Grows less than 1m high.Frost resistant. 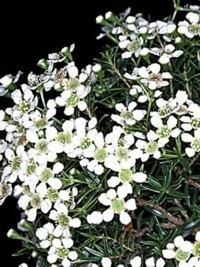 Very dense, low branching large shrub /small tree that bears masses of white flowers 1cm in diameter. Leaves have a very pleasant lemon fragrance. Makes a good taller screen. 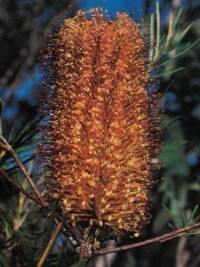 Grows to 6m high in full-sun. A small tree with bright green tear-shaped leaves and graceful weeping branches. 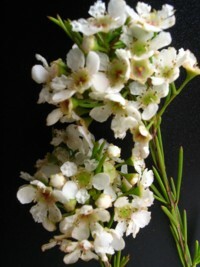 Bears masses white flowers, with persistent green sepals during Summer.Leaves have a Cinnamon fragrance. Grows to 7m in the open. 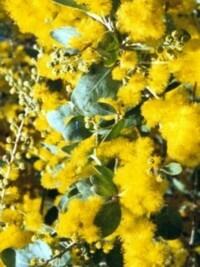 A robust, heavily branched tree with thick, corky bark and large yellow / green flowers, appearing Autumn to early Winter. An excellent bird attractor. 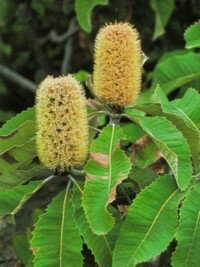 Can grow up to 3m high. 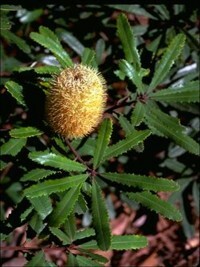 A compact shrub with serrated leaves to10cm long with new growth in a rusty red - brown colour. 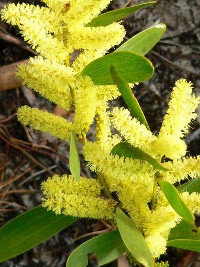 Flowers are yellow / green & appear in Autumn & Winter. Attracts native birds. 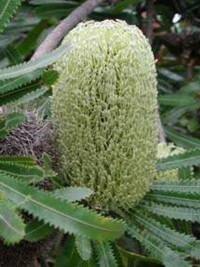 Grows 1 to 2m high. 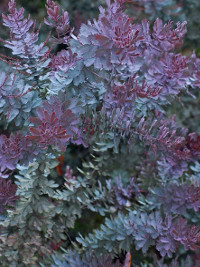 A compact shrub with bright green foliage and large red flower-heads, which are very showy and long lasting, and appear during Winter. An excellent bird attractor. Grows up to 3m high.Frost resistant. 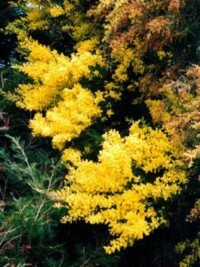 A well shaped, small tree with attractive foliage (dark green on top, silvery white underneath) and yellow flowers appearing from late Summer to Winter. A good bird attractor. 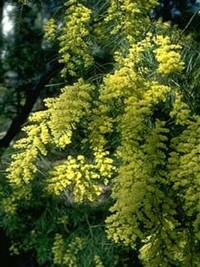 Can grow up to 8m high.Frost resistant. 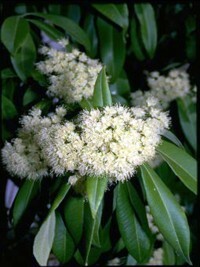 A shrub with large, broad leaves and large flower heads which are blue / green in bud, opening to yellow / green. Tolerates heavy soils and is an excellent bird attractor. 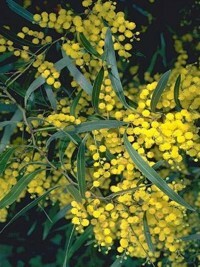 Can grow to 3m high. 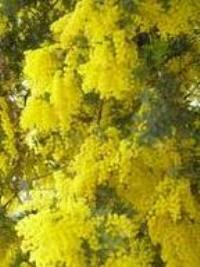 A compact, rounded shrub with attractive foliage and large flower heads with varying colours of gold, yellow or red. A useful screen plant, due to its dense foliage, and an excellent bird attractor.Frost resistant. 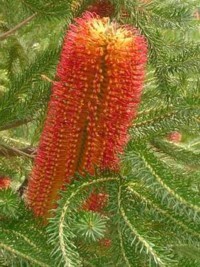 A very hardy and vigorous Banksia hybrid with massive orange / red flowers up to 40cm long. 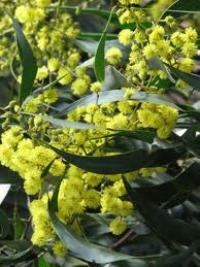 Terrific bird attractor and a magnificent specimen plant that grows up to 4m high.Frost resistant. 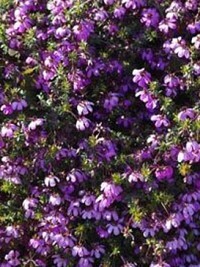 Compact shrub growing to 1 metre high with dark green foliage and deep pink bell type flowers during Winter and Spring. Frost resistant.